From pool to pin-ball to pull-tabs, it is important to have at least some skill in the “pub sports”. 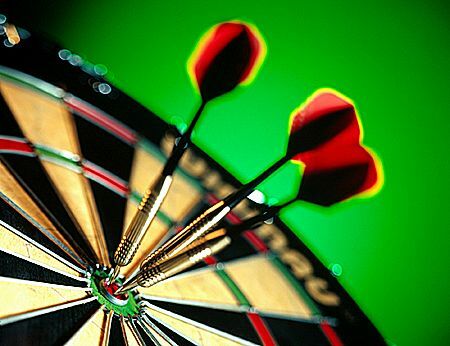 No game, however, is more elegant, graceful and deadly than the game of darts. A magnificent combination of precise accuracy and cold execution, the truly great dart players have a form that is repeatable and a confidence that is unwavering. It is a competition of marksmanship that conjures images of wild-west shootouts or Robin Hoodesque archery tournaments. This easily makes darts the most crowd-pleasing and therefore coolest of all the tavern activities. Interesting variations to add to the game include the Long-Distance Lob and the Left-Handed Huck. Incorporating these styles into your darts game will result in both an increase in danger and an increase in fun. Not surprisingly, it’s often an increase in drinking that precipitates this. This entry was posted on January 2, 2010 at 4:43 pm and is filed under sports. You can follow any responses to this entry through the RSS 2.0 feed. You can leave a response, or trackback from your own site. Hey there! I know this iss kinda ooff topic nevertheless I’d figured I’d ask. Would you be inferested in exchanging links or maybe guest authoring a blog article or vice-versa? frre to shoot me an email. I look forward to hearing from you!